I have a day off today so this post is late. There I said it. However, just because I am not working doesn't mean I'm not geeking out on science and tech. No, it means I am geeking out MORE on science and tech. Which is how I came across this great little video which combines physics and video games. WIN! In this episode of VSauce, they decide to explore the topic of supersonic speed by using Sonic the Hedgehog as a case study. I'm dying to pick up the Dude at school so I can show this to him. I love these types of mashups because it just makes science seem a bit more relevant to his kid brain. How fast can Sonic run? How would his body handle breaking the sound barrier? Would you hear him talking at Mach 1? Is Sonic affected by drag? 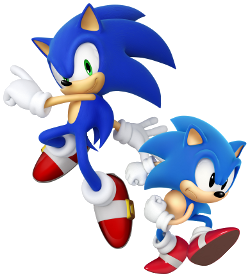 How hot would Sonic get running at Mach 1? How much energy does Sonic use to run?